I should be back over at mattcutts.com. I’m sure some bits have sloshed around in the transition from dullest.com to mattcutts.com–let me know if you see anything truly weird. I plan to talk sometime soon about what I learned in the process of moving to a completely different domain for a month. – Net Applications says that Chrome went from 1.15% to 1.23% in the last ~30 days. – The dev channel switcher to get the latest/greatest features in Chrome. For example, the dev channel uses the F11 key to switch to full-screen mode. You can also delete auto-form-fill suggestions by cursoring down to them and hitting the “Delete” key. How do the browser stats look for your site(s)? And does anyone know of other sources for browser marketshare? I published traffic stats for my blog for 2006 and 2007, so it’s time for the 2008 statistics. 2008: 3.4M visits and 5.7M pageviews, plus 46K RSS readers, 7986 followers on my Twitter stream, and 1607 subscribers on FriendFeed. – My Gmail power tips post. – My “Best Business Card Ever” post. – The series of blog posts about Chrome that I did in September 2008. – My two posts about my Halloween costume and Google’s anti-zombie robots.txt on Halloween. Google and direct visits were a large fraction of my traffic, but so were sites such as Digg, StumbleUpon, Google Image Search, Techmeme, delicious, and Twitter. It’s a good reminder that social media sites and places like image search can drive quite a bit of traffic. 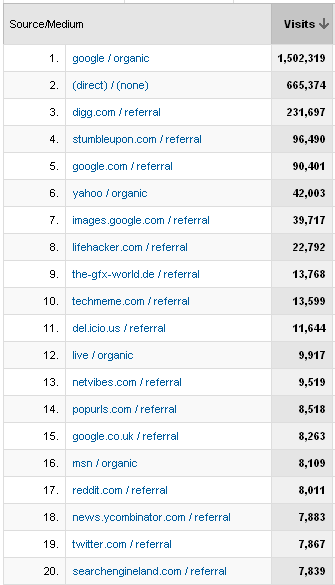 All of this data is courtesy of FeedBurner and Google Analytics, which make this sort of analysis quite easy. What do your 2008 traffic stats look like? OneStat says that they see 0.54% share for Google Chrome. Net Applications provides an hour-by-hour graph, which is nice, but they hardwired it to look for the string “Chrome 0.2” when Chrome is on version 0.3 or 0.4 by now. 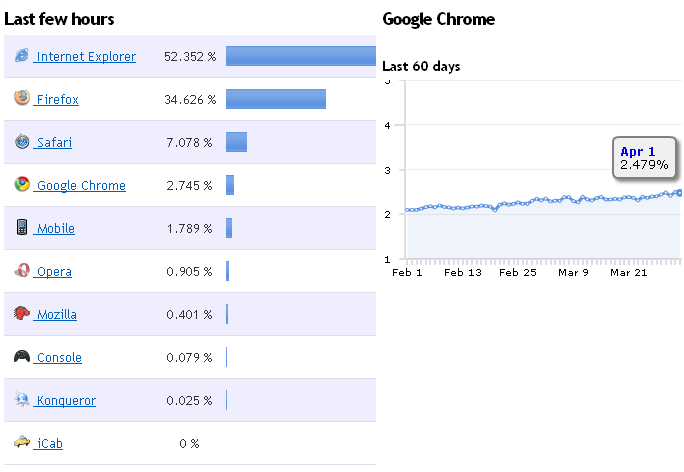 Just eyeballing the Chrome 0.3 version stats, it looked like about 0.85% market share according to Net Applications. Hey Net Applications folks, any chance you’d be willing to roll up all the Chrome versions into your hourly report? I hadn’t realized that Internet Explorer usage had dropped so low for my site (~26%). 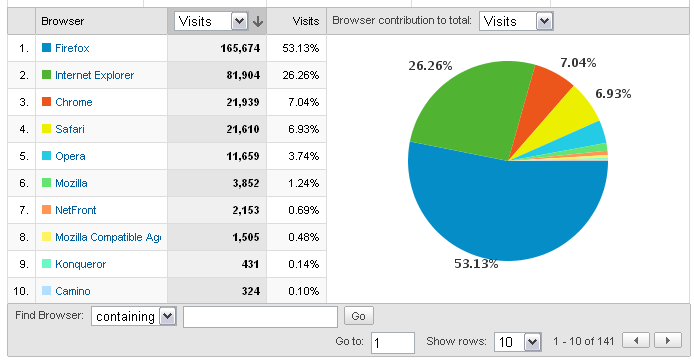 What does your browser marketshare stats look like for the last month or so for your site(s)? Use the ‘Customize and control Google Chrome’ (wrench) menu to open the Bookmark manager. You can search bookmarks, create folders, and drag and drop bookmarks to new locations. The Bookmark Manager’s Tools menu lets you export or import bookmarks. Personally, I run the dev channel version of Chrome because I like to see what cool features are coming soon. I think the dev channel has averaged weekly updates, which is really nice because you can literally watch plug-in fixes and other improvements arrive every few days. It’s wild to see client software updated that often instead of every few months. Update, 11/28/2008: Somehow I missed the getclicky.com browser marketshare stats from 60K+ sites. They peg Chrome at 1.55%, with a little bit of 1.6% to 1.7% in the last week or so.